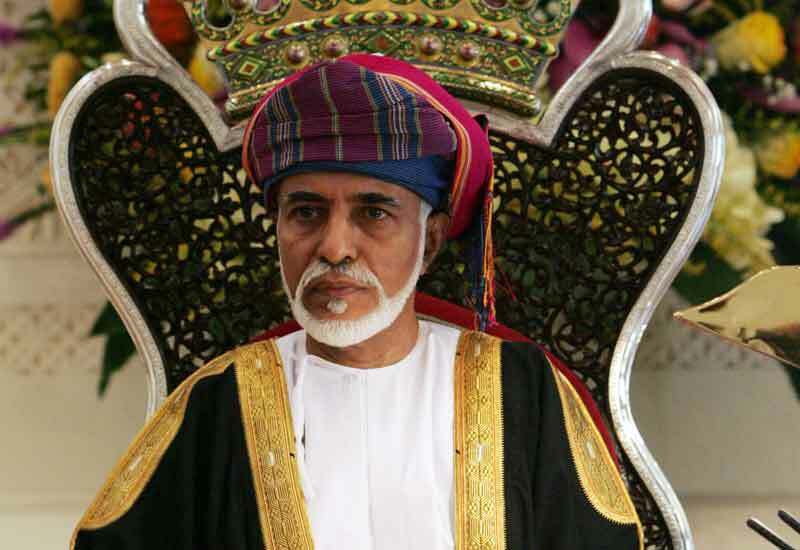 Home / local news / Oman / Seriously big changes in Oman's Government. Seriously big changes in Oman's Government. 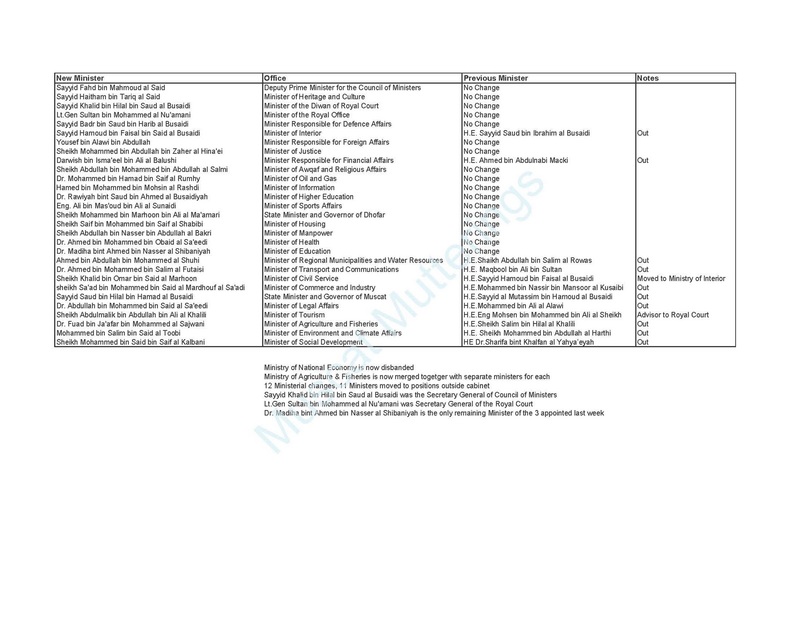 Below is a table detailing all of the Cabinet shuffles announced today. Click it to make it bigger. This news is still breaking, and the Royal Decrees came so fast that it has not been possible to record everything that has just happened today, and the Oman News Agency website has not yet updated with the information. The Minister of the National Economy, Ahmed bin Abdul Nabi Macki, has not only been removed, but his entire Ministry has been eliminated. For those not following events too closely, Ahmed bin Abdul Nabi Macki was one of the 6 people that protesters have demanded removed from office. Presumably, those staffers that used to work for the MONE will now be absorbed into other ministries, perhaps the Ministry of Finance and possibly State Audit. As for the job that the MONE used to do, this will now be done by a committee instead. Engineer Mohsin bin Mohammed bin Ali al Shaikh, who was recently appointed as the Minister of Tourism, is now an advisor to the Royal Court. The new head of Tender Board is Dr. Rasheed Al Huraibi, who has now been made a minister. There are many more changes but thats all I have for now.... all in all, 12 Ministers have been removed from office. I'll update later. - Sayyid Fahd bin Mahmoud al Said, Deputy Prime Minister for the Council of Ministers. - Sayyid Haitham bin Tariq al Said, Minister of Heritage and Culture. - Sayyid Khalid bin Hilal bin Saud al Busaidi, Minister of the Diwan of Royal Court. - Lt.Gen Sultan bin Mohammed al Nu'amani, Minister of the Royal Office. - Sayyid Badr bin Saud bin Harib al Busaidi, Minister Responsible for Defence Affairs. - Sayyid Hamoud bin Faisal bin Said al Busaidi, Minister of Interior. - Yousef bin Alawi bin Abdullah, Minister Responsible for Foreign Affairs. - Sheikh Mohammed bin Abdullah bin Zaher al Hina'ei, Minister of Justice. - Darwish bin Isma'eel bin Ali al Balushi, Minister Responsible for Financial Affairs. - Sheikh Abdullah bin Mohammed bin Abdullah al Salmi, Minister of Awqaf and Religious Affairs. - Dr. Mohammed bin Hamad bin Saif al Rumhy, Minister of Oil and Gas. - Hamed bin Mohammed bin Mohsin al Rashdi, Minister of Information. - Dr. Rawiyah bint Saud bin Ahmed al Busaidiyah, Minister of Higher Education. - Eng. Ali bin Mas'oud bin Ali al Sunaidi, Minister of Sports Affairs. - Sheikh Mohammed bin Marhoon bin Ali al Ma'amari, State Minister and Governor of Dhofar. - Sheikh Saif bin Mohammed bin Saif al Shabibi, Minister of Housing. - Sheikh Abdullah bin Nasser bin Abdullah al Bakri, Minister of Manpower. - Dr. Ahmed bin Mohammed bin Obaid al Sa'eedi, Minister of Health. - Dr. Madiha bint Ahmed bin Nasser al Shibaniyah, Minister of Education. - Ahmed bin Abdullah bin Mohammed al Shuhi, Minister of Regional Municipalities and Water Resources. - Dr. Ahmed bin Mohammed bin Salim al Futaisi, Minister of Transport and Communications. - Sheikh Khalid bin Omar bin Said al Marhoon, Minister of Civil Service. - Sheikh Sa'ad bin Mohammed bin Said al Mardhouf al Sa'adi, Minister of Commerce and Industry. - Sayyid Saud bin Hilal bin Hamad al Busaidi, State Minister and Governor of Muscat. - Dr. Abdullah bin Mohammed bin Said al Sa'eedi, Minister of Legal Affairs. - Sheikh Abdulmalik bin Abdullah bin Ali al Khalili, Minister of Tourism. - Dr. Fuad bin Ja'afar bin Mohammed al Sajwani, Minister of Agriculture and Fisheries. - Mohammed bin Salim bin Said al Toobi, Minister of Environment and Climate Affairs. - Sheikh Mohammed bin Said bin Saif al Kalbani, Minister of Social Development. Article Two: The decree come into force from its date of issue. Article One: Appoints Sheikh al Fadhl bin Mohammed bin Ahmed al Harthy as a Secretary General of the Council of Ministers. Article Two: The decree comes into force from its date of issue. Article One: Appoints Sheikh Nassir bin Hilal bin Nassir al Ma'awali as a Chairman of the State Audit and Administrative Institution with the rank of Minister. Article One: Appoints Dr. Rasheed bin al Safi bin Khamis al Huraibi as a Chairman of the Tender Board with a rank of minister. Royal Decree No. 35/ 2011 Appointing Advisor at the Diwan of Royal Court. Article One: Appoints Eng. Mohsen bin Mohammed bin Ali al Sheikh as an Advisor at the Diwan of Royal Court with a rank of minister. Royal Decree No. 36/2011 Appointing Advisor for the Finance Ministry. Article One: Appoints Dr. Abdulmalik bin Abdullah bin Zahir al Hina'ei as an Advisor for the Finance Ministry with the same rank and financial allocations. Article One: Appoints Dr. Hamad bin Said bin Sulaiman al Ofi as an Undersecretary of the Ministry of Agriculture and Fisheries for Fisheries. Article Two: Appoints Dr. Is'haq bin Ahmed bin Mohammed al Ruqaishi as an Undersecretary of the Ministry of Agriculture and Fisheries for Agriculture. Article Three: The decree comes into force from its date of issue. Article One: Cancels the Ministry of National Economy and a committee shall be formed by the Council of Ministers to manage distribution of its prerogatives, allocations, assets and employees. Sounds very serious, but ehm, if ONA is not so fast, who/what is yours source if I may ask such a blunt question? Ah, nevermind, following the news more closely while typing. Keep up the good work! Don't keep us in suspense! Please tell us more! Dnt Worry we knw hw to take care of our land !!!!!! So, for those of us watching from afar and hoping all goes well for all of you, what exactly does all of this mean? Don't most Omanis also want a fully elected majlis with power? This is MORE THAN what these demonstrators could have wished for!!! GOD BLESS OMAN, MAWLANA THE SULTAN, AND ALL OUR PEOPLE!!! The Sultan is listening and acting in his country's best interest. 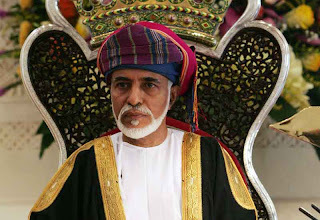 Long Life His Majesty Sultan Qaboos! But just a quick note. 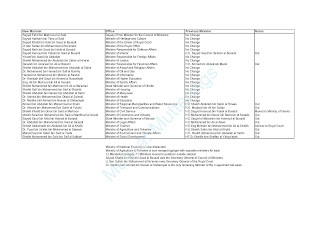 in your footnotes with the list of ministers, the second one says separate ministers for fisheries and agriculture. it should read separate undersecretaries. Great to have these changes. But what about the Minister for higher education - well known fact that she hands out 'scholarships' to the rich and not the needy!! Can you please provide us with the qualifications / education background / and ages of all the new ministers? What makes these new ministers more qualified than, um ... , some guy just walking down the street?